System types can be organized around fuel, such as electric and gas. We will consider propane, Petroleum gases and natural gas as the same. You will see fuels such as wood or pellets, particularly as backup systems when the electric goes off. There are many other kinds of fuels, such as oil or coal, but since seldom or almost never seen in this market, they will not be included. Solar, a sought-after player in energy efficiency, will be discussed later. Forced Air systems heat air then moves it into the correct rooms. The heated or cooled air is then transferred to you and your furniture, walls… The moving air provides many ventilation and cooling advantages, but moving air also tends to make you feel cold during the heating cycle. To purchase a central air conditioning system without a heat component is almost the same cost as the combination, so they are usually the same unit. Radiant (hydronic) generally is heated water that is piped to radiators, or tubing concealed in the floor. The heat is then “radiated” to you. This is the same system the sun uses and considered by most to be the ultimate heat. Radi ant cooling is possible, but just developing into the residential market. So to get the heating benefits of radiant you have to add a forced-air cooling system, and that may almost double the cost. Some people building new efficient homes mix systems. But, redundant systems such as radiant floor heat plus forced-air conditioning adds a lot of upfront cost. There are ways to combine the two technologies, but these are not the norm. As you can see, there are too many options and approaches to choose. For most it is the best value approach that is chosen. But, we must recognize that personal desires can dictate over budget and efficiency. Wood heat is an option for some, but not practical for high energy-efficient homes in most cases. The difficulties include too much heat and the inability to turn it off. Wood heat is the most common for a “backup system” in case of power outages. In some cases a backup system can be eliminated by a small generator that will make your gas-fueled system function, as well as your lights and refrigerator. ASHP is very common because of initial install price, Air Source Heat Pump (ASHP) has often been the system of choice. There is no other way to get heating and air conditioning for a whole houses for less money with some efficiency. The exception on upfront cost would be a total electric furnace/air conditioner, if you could find one to buy. If you find one, don't do it. We saw these years ago before ASHP took the market. It was a way to get central air and heat in one unit. But, electric only as a heating system is equal to an electric toaster with a fan. It will cost more to heat this way than any other. Electricity may be near 100% efficient, but the generation and transmission to your door can consume 70% of the energy before you get it. An ASHP system “pumps” the heat and cold out of the exterior air. The technical explanation is complex but it involves the extreme amount of energy released from condensation and evaporation. By placing the refrigerant gas under pressure, turning it into a fluid, and then evaporating the fluid back allows amazing amounts of heat to be transferred. You have experienced the same thing with your personal air conditioning system known as perspiration. As the "sweat" evaporates, you are cooled down. That is why your A/C compressor unit outside blows very hot air out the top in the summer. It is pumping the heat out of the house. Here we find the installation cost advantage to ASHP. They are simply an air conditioner that runs backwards in the winter time. Instead of pumping the heat out of your house, they pump what heat they can find outside into your house. It is a great value. To a large degree it is just a few parts and a controlling system and you get a heating system for almost nothing. It is always cheaper to pump heat than to manufacture heat from fossil fuels. ASHP works great up to extreme temperatures. As the exterior temperature approach 95 to 100 degrees in the summer, and the teens on down in the winter, ASHP systems begin to struggle. How well they function depends on how hot or cold the air is outside. In the winter at extreme temperatures, they switch to electric resistance to heat the house. You hear the complaints about the outrageous utility bills every time we have a long, hard cold winter. ASHP are not efficient at the extremes when you need them the most. In the winter the normal ASHP becomes nothing more than an electric hair dryer. And so goes the love fair with ASHP. They are, most of the time, a great answer with a low install cost. If it is about “upfront” cost ASHP is the best value. There are ASHP that work down to near zero degrees and below starting to appear in the market, but are much more expensive. For all air source equipment, they do the best they can in the summer in the air conditioning mode. There is not much cold in 105 degree air. Mini Splits are an ASHP with no duct system. They have been around for years, but not in this country. There is a small exterior compressor outside that is connected to multiple “heads’ or coils in all key rooms. They still are forced air, but the blower unit is usually direct into the needed space. These systems often have a multi-stage compressor that is barely working, resulting in a very high operational SEER rating. With no need for duct systems we also lose the issue of duct leakage and the difficulties of getting the correct amount of heat or cold in individual rooms. They are rapidly taking root in our market. In time I think the price will drop and they will rule in many situations. Gas is just about the best way to produce heat. The old, natural draft gas systems of years ago 50% to 80% efficient are almost gone. The 90% and above systems, called condenser units, pull air in one pipe, burn the fuel, and exhaust the fumes out another. The “condenser part” reclaims the heat lost in the burning process with the byproduct of water vapor. You can buy units in the 97% to 98% efficient area, with 95% becoming very common. Compare this to electric resistance heat where the "juice" is often generated by natural gas and has lost a large percentage from heat loss during the generation and more during transmission line losses. It’s not the fuel but the delivery and manufacturing cost. Please don’t miss understand, electric has many qualities that nothing else can touch, but in many cases homes heated by gas products get more heat per dollar. There may be issues with local gas providers with monthly charges, pipelines, tanks, or wildly volatile price swings, or other delivery issues but gas heat is extremely popular for a reason. The issue we find with gas furnaces is not with the nature of the equipment, but with the gas delivery to your door. All systems have some kind of a negative, and back in the day gas heating systems had a drawback in the area of safety. The natural draft systems could malfunction and start putting carbon monoxide into the air you breathe. However, safety issues for gas have all but disappeared with the condenser ninety percent plus systems. The common answer of a gas heating unit is to add air conditioning equipment in the same duct system using the same blower unit. It is a match with years and years of satisfactory performance. But there are now alternant ways, as seen below. 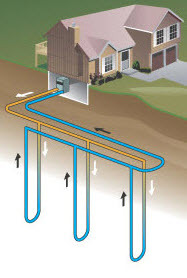 Ground Source Heat Pumps are exactly what they sound like. They pump heat from the ground. Unlike ASHP, which pumps the heat using outside air, GSHP pump the heat out of the ground, or large ponds or lakes. Lakes and ponds get tricky, but the applications "ground source" systems are very simple in requirements. You find two common approaches: wells and trenches. The wells are not like normal water wells, they are just a 200' deep hole with a tube going down and back up. The drilling is simple and rock is not an issue for the drillers. The trenches are 6' deep and about 250' long. Because of all the rock hidden below the surface here in the Ozark Mountains the wells are often the best answer. By now you can see innate advantages. Ground temperature is around 55 to 60 degrees year around with solar heat added daily. The amount of energy is much more than we can ever use because of the gigantic mass of the earth. We cannot exhaust this source and it is always constant. It is true that as a season goes by the degrees may slightly change, but there is always more than enough energy to pump heat and cool into your house. GSHP equipment in the house is about the same as ASHP equipment. The difference is with the wells or trenches. The cost of the wells varies but a simple rule of thumb is $2000 a well, with one well needed per ton. This can makes GSHP system much more expensive. While performance is off the carts better, payback may take several years. Washington often has a 30% tax credit (dollar-wise works like a rebate over time), that changes everything. In many cases the cost is about the same as a high efficiency gas system, sometimes less. You still have to pay the full cost upfront, but the money comes back quickly according to your income tax levels. GSHP also requires a trained designer and installer. They run a Manual J to correctly size the system. This often reduces the number of tons needed and hence the expense of additional wells. In other words the GSHP guy is “thinking” and working with us in energy efficiency concepts. He wants to keep the number of wells down to keep his bid lower to get the job, and we want the correctly sized system designed. It is a win, win situation. Ground Source Heat Pump systems often have a "resist heat strip" added in case of a pump failure. And it is possible to make them a dual fuel system. With a gas back up and a small generator you can run the system if the power goes off. We might also note that GSHP with a de-superheater can be used to produce some of your domestic hot water needs almost free during AC season. GSHP can also work with radiant floor heating. It depends on your requirements, the capacity of the system and availability of system controllers. And my favorite part, there is no outside compressor to rust away and go bad. While very rare in this part of the country a Hydronic furnace offers many advantages. These systems may vary in concept but one of the best is a factory unit that works off a large, high- efficiency, tank-less water heater. This instantaneous unit can run the showers in the house all day and provide the heat for the forced air system at the same time. The integrated controls keep everything working correctly. This concept overcomes the extra expense of having two high efficient heating units side by side. High efficient water heaters tend to be very expensive, so often an older design 60% natural draft water heater is used use to keep installation costs down. With it comes the combustion air vents bringing unwanted outside air into your house for safety reasons. This can make the heating of hot water the most expensive part of your energy cost, not to mention the infiltration added by the required combustion air safety vents. By using only one high-efficient tank-less heater for domestic water and the whole house heating, we have removed redundant cost and construction cost. The result is upfront savings and the energy saving for the life of the system. This type system can also, in some cases, be used for radiant floor heating. There are codes, controller systems, and sizing issues in combining the systems that must be worked out. The concept of a multi-tasking heating unit has many advantages, but only a few companies make the equipment and most installers have never seen one. Ventilation is the lost part, the missing “V”, of HVAC in most houses. We did not need it years ago. Houses were so leaky that we used “natural” ventilation. It was free, but it cost you a lot. In the tight house we build today we need to make sure that the correct amount of ventilation is installed in every house. The math comes from ASHRAE 62.2 and the ventilation comes from one of three common ways: Exhaust Fans and timers, Recyclers, or ERV. This is a must do, and will be covered in a separate article. All you need to know for now is that it is necessary, and doesn’t cost much to install or operate. We will help you pick the best answer because it depends on many of your other choices. So what is the best answer? Is GSHP the answer for every home or is ASHP, mini splits or some type gas system? The answer depends on many things. Each project needs to select the best answer for the specific project and location. In most cases past experience, upfront cost, local trends and availability or just personal preference will make your decision. It is part of the Energy Strategy Study and we will help work you through it.